– Terry O’Neill, president of the National Organization for Women. This quote came in response to the debate that erupted when celebrity news website TMZ released a second video of Ray Rice, star running back for the National Football League’s Baltimore Ravens, viciously punching and knocking out his then-fiancée Janay Palmer. In February Rice had been arrested for that incident after an earlier video was released, showing him dragging Palmer’s unconscious body out of an elevator in an Atlantic City hotel. Outrageously, Rice was placed in a diversionary program after pleading not guilty to the charges – charges which will be dropped after a year if he completes the program. 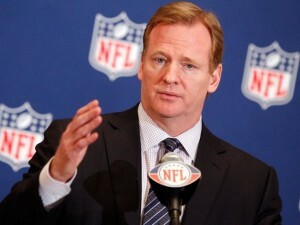 For many people, the even more outrageous event was the fact that NFL Commissioner Roger Goodell only suspended Rice for two games at the beginning of the current season. Goodell has tried to make a name for himself by being tough on player misconduct. The NFL recently suspended the Cleveland Browns’ receiver Josh Gordon for the entire season for testing positive for marijuana for the second time. Marijuana, of course, has been legalized in a number of states including Washington and Colorado, the two states that provided the teams who faced off in last year’s Super Bowl. In no state is domestic violence legal. The light punishment that Rice received immediately provoked a backlash among advocates against domestic violence and women’s rights groups. According to the NFL’s numbers, women make up 45% of its fan base. Every October, during Breast Cancer Awareness Month, the NFL promotes the slogan “Crucial Catch.” They have the referees use pink flags to signal penalties as opposed to the usual yellow. They sell pink jerseys and other merchandise. They use pink game balls. The hypocrisy between the two-game suspension given to Rice and the Breast Cancer Awareness actions had the potential to seriously alienate that sizable proportion of the NFL’s fans they appeal to through their “Crucial Catch” public relations campaign. At first, Goodell and the NFL stood by the punishment, stating that the two games were “significant.” They cited the light punishment that Rice received from the government to justify the light punishment the league handed down. But the backlash grew even stronger, and eventually Goodell relented. He announced just prior to the start of the season that new rules were being put into place regarding domestic violence. Now a first-time offense will garner a six-game suspension and a player making a second offense will receive a lifetime ban, though that ban can be appealed after a certain number of years depending on the circumstances. If Goodell and the NFL hoped to avoid further criticism by taking this action, they were seriously undermined when TMZ released the second video revealing the actual attack. Criticism came fast and furious. It not only came from advocates against domestic violence and women’s rights groups this time, but from all corners. Even normally reserved ESPN reporters such as Adam Schefter were visibly mad and implied that the league had lied to them. The NFL and Goodell eventually acted and indefinitely suspended Rice, but almost fittingly, the Baltimore Ravens were the first to act when they cut Rice from their team. Like the NFL and Goodell, though, this move was neither brave nor praiseworthy given their absolutely atrocious inaction previously. The team refused to give Rice a harsher punishment than what the league handed down, though they were fully within their rights to do so. The team stood behind Rice through the whole process, even going so far as having head coach John Harbaugh describe Rice as a “heck of a guy.” The team also tweeted out victim-blaming statements such as “Janay Rice says she deeply regrets the role that she played the night of the incident.” Many people would later cite this quote on social media as they sought to exonerate Rice by engaging in similar victim blaming. Many societal factors have led to this epidemic of violence. The NFL is not immune to these factors. Greg Hardy of the Carolina Panthers was found guilty of choking and threatening an ex-girlfriend last summer. Simply because he is appealing that conviction, the NFL and Panthers have allowed him to play so far this season. The most infamous recent case of domestic violence though was the case of Jovan Belcher of the Kansas City Chiefs. On December 1, 2012 he shot to death his girlfriend and then killed himself at the team headquarters in front of his head coach and the general manager of the Chiefs. These are just a few sample cases. 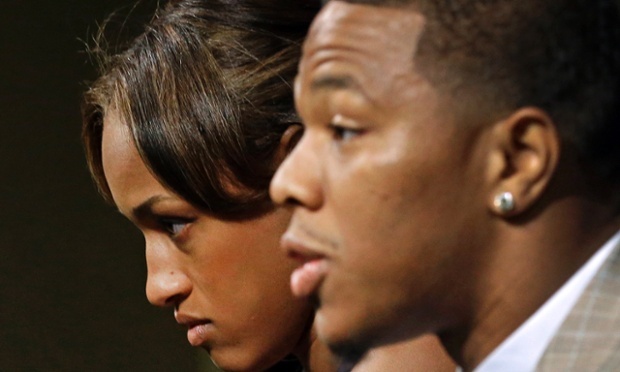 Many theories have been given as to why domestic violence is so common in the NFL. What is clear, however, is that the NFL will not act until they believe that their profit is in danger. Clearly that was the motive behind the Ravens cutting Ray Rice and then the NFL suspending him. 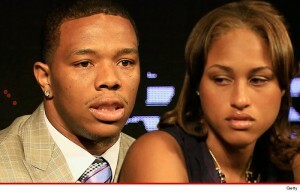 They acted only after it became clear that the TMZ-released video changed the public perception of Rice’s attack on his fiancée. 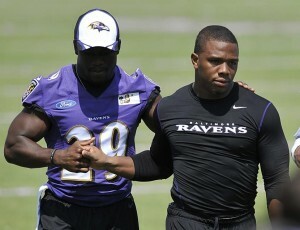 The league and the Ravens could no longer pretend that what happened in that elevator was an unfortunate lovers’ spat. They had to face up to what it was, a vicious attack. That change in public perception endangered the NFL’s product and thus their profit. The NFL is not the league itself but is made up of the team owners. The team owners control the NFL and make the rules. We should demand that the Ravens own up to the mistake they made in standing behind Ray Rice. The people in the front office who made the decisions to tweet victim-blaming messages and to allow Ray Rice to remain a part of the team should resign or be fired. Roger Goodell, at the time of writing, is still denying that anyone in the NFL front offices had seen the TMZ video prior to its release to the media. Even if they had not seen it, which given the evidence is highly doubtful, he should either resign or be fired. 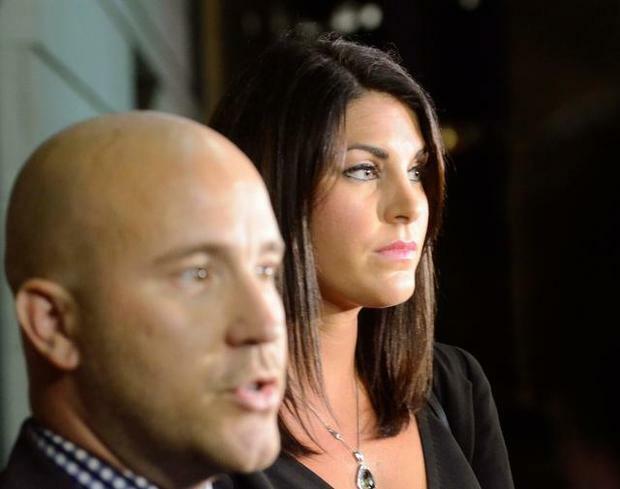 It is inexcusable that smoking marijuana should have garnered a harsher penalty than knocking a woman unconscious. Goodell is responsible for those hypocritical penalties. But as long as profit is the driving force behind the running of the NFL, these resignations and firings will make very little difference. 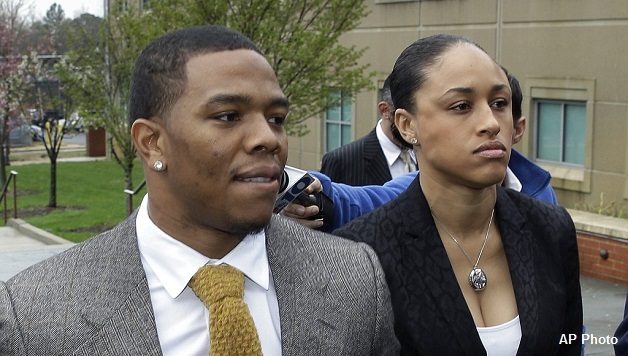 The Ray Rice case is instructive. It shows the power that fans of the NFL and others have. The Baltimore Ravens and the NFL were forced to act because of the outrage felt by fans, groups against domestic violence, and women’s rights organizations. If this outrage was concentrated and focused, we could enact real change within the NFL. The NFL owners are prepared to ignore domestic violence and other destructive issues that affect fans, players, and players’ families as long as it is profitable. This is a backwards and barbaric way to run the game that millions of working-class Americans love. Fans, alongside anti-domestic violence groups and women’s rights organizations, if organized and focused, could force the owners to enact stronger and lasting reforms to improve the NFL. The billions of dollars now going to line the owners’ pockets could be used for such things as funding shelters for the victims of domestic violence and funding centers for counseling and support for victims. Ultimately, the NFL should be taken into public ownership so that the game we love could be played for the benefit of the players, their families and us, the fans, instead of an elite group of millionaires and billionaires. If football was a publicly-owned, democratically-run sport, rather than a private profit-driven business, then much stronger measures could be taken to eradicate domestic violence within the league. Let’s make this debate about domestic violence in the NFL a rallying point for the fight against domestic violence in society at large. And let’s fight for a society where our community institutions are owned and run by the people for the people, rather than for the profit of a few. [i] Patricia Tjaden and Nancy Thoennes, “Extent, Nature and Consequences of Intimate Partner Violence: Findings from the National Violence Against Women Survey,” National Institute of Justice and the Centers for Disease Control and Prevention, (2000). [ii] “Costs of Intimate Partner Violence against Women in the United States,” Centers for Disease Control and Prevention, National Centers for Injury Prevention and Control; Atlanta, GA (2003). [iii] Federal Bureau of Investigation, Uniform Crime Reports “Crime in the United States, 2000,” (2001).